"Best Karate School in Virginia Beach, Virginia U.S.A."
See Special info below for Karate Class Coupon and Champion Gear! "To be the Best you have to train with the Best!" Get $25 Dollars off your intro program when you register. Just print off this coupon. to get your one Week FREE Karate Class. Call or E-mail Us and mention this on-line coupon to Get a FREE WEEK of Martial Arts Classes added when you register for our Intro Program at the Ryoshin-Kan Karate School. you can learn Martial Arts from a Hall of Fame and National Champion Master. Sensei Thompson is a Retired Navy Veteran and he understands the needs of Military Veterans (Active, Reserve, Retired etc…) and their Families. You all served your country and now Ryoshin-Kan Karate School is here to serve you. All Military Veterans and Their Families get a special discount. "The Best Martial Arts Adult and Children Classes in the Virginia Beach, Virginia Area!" one Free Week of Karate. While developing these character traits, the individual will be learning a state of the Art, realistic Self-Defense System. Click on Photo for Cool Karate Gear! Click on the Karate T-Shirt Photo to Go to the Official Ryoshin-Kan / Dragon Force Martial Arts on-line store. It is loaded with cool Karate Gear! NEW DVDS: Dragon Force National Karate Demo Team. (BRAND NEW DVDs) These Martial Arts DVDs show the awesone and award winning Dragon Force National Karate Demo Team performance at the Strawberry Festival, Christmas Shows, World Cup National Martial Arts Championships and more. The DVD shows the Dragon Force Demo Team performing their award winning National Routines to include Weapons, Kata, Self-Defense, Breaking, Acrobatic Martial Arts Stunts and more. These awesome Karate t-Shirts / Sweat Shirts are black with gold and white lettering / logos. We have all sizes from youth Small to Adult XXL. The T-Shirts are in honor of our Ryoshin-Kan Karate School's Dragon Force National Karate Demo Team, which won the 1st Place Grand Champion National Trophies for "Team Demo" at the Battle of the Martial Arts National Championships, US Classic National Karate Championships, World Fall Classic Martial Arts Championships, and World Cup Finals Martial Arts Championships.Team Dragon Force are World and National Karate Champions. Get your T-shirt today and make a donation to the Ryoshin-Kan Karate School. Send us an e-mail with your size, Full Name and Mailing Address. (Donation of $30 plus shipping). 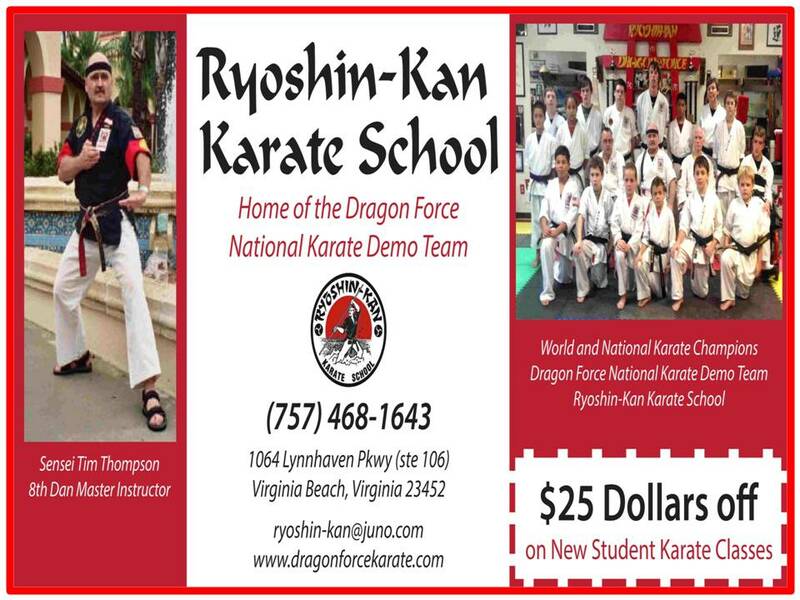 Discounts apply when you pick up your gear at the Ryoshin-Kan Karate School in Virginia Beach, Virginia. DVD / MOVIE: "The Adventures of Dragon Force"
COMIC BOOK: "Dragon Force Karate Demo Team Comic Book"
This awesome collector's Edition Comic book came out in 1993. It is the basis for the "The Adventures of Dragon Force Movie" The Comic book was created by Sensei Tim Thompson and Sempai Alfred Alejandro. The Drawings are by Sempai Tony Lamotta. It tells the story of the Dragon Force Demo Team from the Ryoshin-Kan Karate School in Virginia Beach, Virginia fighting the Evil Ninja Pigs. We are currently developing instructional DVDs on Karate, Kobudo, Kenjitsu, Goshinjitsu, Tameshiwari and Demo Team. The DVDs will feature instruction by Shihan Tim Thompson, a Martial Arts Master, National Champion and Hall of Famer. Keep checking back to see the latest DVDs. If you have questions, suggestions or want to place an order send us an e-mail. ORDER NOW! Send us an e-mail include what DVDs you want to order, your mailing address, and Telephone number. One of our Staff Members will get in touch with you to discuss your Order. Thank You ! 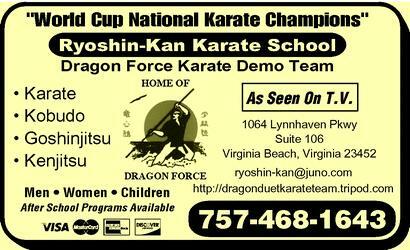 The Martial Arts classes conducted at the Ryoshin-Kan Karate School in Virginia Beach, Virginia are the Best. This program helps to instill Discipline & Self-Esteem, while improving the Adults & Childs Physical Conditioning and Self-Defense Awareness. Academics, Physical Fitness and Positive Spirit are number one at Ryoshin-Kan.
Give the gift of Honor and Discipline to yourself and your love ones. "Come Train with the Best and have fun while learning the Martial Arts." 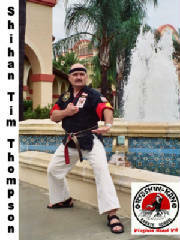 Shihan (Master) Tim Thompson is available to do Martial Arts Private Lessons for you and your family / group. 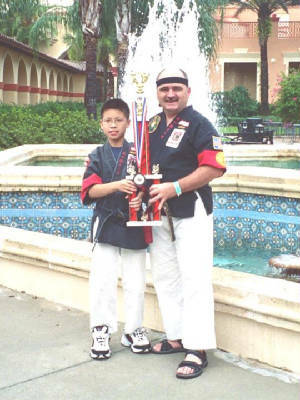 Private Lessons can include training in one or more of the following areas, Karate-Do, Kenjitsu, Kobudo, Goshinjitsu, Demo Team, and specialized techniques. Private Lessons are an excellent way to prep for a Tournament, Belt Test or Demo. This is a great opportunity to train directly under a real Hall of Fame and top Martial Arts Master one-on-one. Join Women's Self-Defense Program for a self-defense education that is fun! The Women's Self-Defense class is designed for 17 year old females and up. These Classes includes Self-Defense awarness, Self-Defense Techniques, Fitness and more. You can bring your friends to these classes. Private lessons and seminars are also available. All Females can also attend their age group / experience level classes during the week. Call (757)468-1643 or E-mail for details. Ryoshin-Kan Dojo Kobudo Patch & Qualifications Program. Any Ryoshin-Kan student with the rank of purple belt or higher, can now qualify to wear one of the Kobudo (weapons) patches on your black or white ghi (uniform). You are only allowed to wear one weapons patch per uniform. We have patches that represent the BO. Kama, Sai. 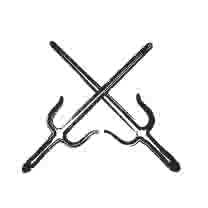 Nunchaku, and Tonfa. If you qualify in more than one weapon and have several uniforms then wear a different weapons patch on each uniform. In the past the only ones wearing the patches were Black Belts on the Demo Team and they only wore it on their demo uniform. I have now authorized the wearing of the patch to all students who qualify for the patch. The wearing of the patch does not mean that you are certified a Black Belt in that weapon but it is a milestone towards eventual Kobudo Black Belt Certification. You have to demonstrate self-defense applications of the weapon. You have to demonstrate the weapon at a demo, special event or Tournament. Shihan Tim Thompson has to watch you perform. Shihan Thompson will award the Wearing of the Patch to individuals that qualify. The Cost of the Patch Program is $20 dollars and it will be placed in the Dragon Force Donation Bottle. 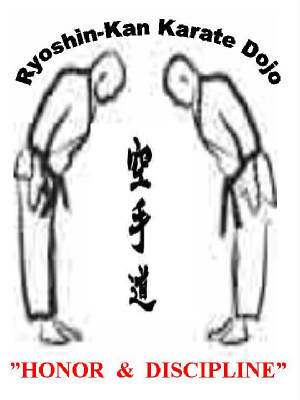 For More details send Sensei Thompson an e-mail or see him at the Ryoshin-Kan Dojo. We at Ryoshin-Kan Karate School are here to assist you.